I was at a party this weekend and bumped into a friend I don't often see. He works for a London-based Ad Agency and was ruminating about how his firm had just won some business with a National newspaper group. The objective they have been given was to convert users of their on-line sites to become customers for their printed publications. He asked me what I thought about the challenge.. I had to relate to him the thoughts of Warren Buffett, the legendary US investor who was addressing the issue of the Internet vs Newspapers recently. 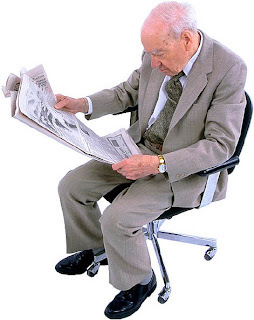 Buffett asked a group of people to imagine that the Internet existed and that newspapers did not and then explained to them the proposition for establishing the new concept of a paper-based newspaper. 'So first we'll call up some guys in Canada and get em to cut down a whole load of huge trees. Then we'll get em shipped to some other guys in factories and get em to pulp em up and make paper out of them. Then we'll ship the paper all over the US and get a bunch of guys to run these huge rolls of paper through the printing presses in the middle of the night and then they can cut it up and ship it out in a huge fleet of trucks all the way across the country. But.. just because you know the party has to end at some point doesn't mean you shouldn't enjoy it while it's still raging now does it?